where is the log-likelihood contribution of the ith observation that has weight , and is the value of the frequency variable. For the determination of and , see the WEIGHT and FREQ statements. 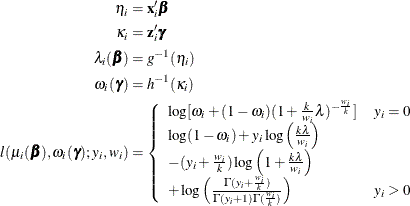 The individual log likelihood contributions for the various distributions are as follows. where h is one of the following link functions that are associated with binary data: complementary log-log, log-log, logit, or probit. These link functions are also shown in Table 52.9.
and is the Tweedie probability distribution, which is described in the section Tweedie Distribution. Evaluation of the Tweedie log likelihood for model fitting is performed numerically as described in Dunn and Smyth (2005, 2008). where . This EQL is used in computing initial values for the iterative maximization of the Tweedie log likelihood, as specified using the OPTMETHOD= Tweedie option in Table 52.5. If you specify the OPTMETHOD=EQL Tweedie-optimization-option in Table 52.5, then the parameter estimates are computed by using the EQL instead of the log likelihood.